Brian checks out the views on the way up Elk Mountain. Oklahoma is a prairie state. That’s its identity, and for the most part it’s accurate. But that also discounts the fact that the state contains wooded hills, desert-like terrain and in its southwestern reaches, rugged, ancient crags we know as the Wichita Mountains. They’re not lofty by any stretch. Having stood for over half a billion years, you’ll forgive the effects of erosion over time. The Rockies, the Appalachians and the Ozarks are babies by comparison. But the venerable Wichitas still stand, popping up from the flatness of the Southern Plains between the military towns of Lawton and Altus. They’re out of place: craggy, alien forms that don’t match the sweeping plains dominating this part of the state. You might say there’s a geological generation gap going on there. I’ve spent a decent amount of time there, hiking the wide valleys and rocky slopes inside this range, sharing the space with buffalo, elk and other prairie wildlife that call the Wichitas home. The U.S. Fish and Wildlife Service oversees and wildlife refuge here, and within that refuge is one of the state’s few true wilderness areas. It’s not big, but it’s definitely wild. I moved to Tulsa seven years ago, and since arriving, I haven’t been back to the Wichitas. A real shame, because that’s the place I spent time hiking and climbing in preparation for bigger adventures in the Rockies. What I’ve learned is that the Wichitas are a fine destination of their own. I missed this place, my Oklahoma happy place, and yet hadn’t set foot there in some time. That changed recently. I have a friend who had never been there, someone breaking into the world of hiking and backpacking and eager to test his gear and his legs somewhere. After spending some time on the trails of northeast Oklahoma, he was willing to give the Wichitas a try. The plan: drive to the refuge, make camp, and hit a few of the easier highpoints before calling it a night. Then get up the next day and do a deeper dive into the wildest patch of the range. After seven years, I just hoped I wouldn’t get us lost. I met Brian Hoover a few years back, probably at one of the races his company puts on. He got into trail running several years ago, began organizing events, and eventually TATUR Racing became one of northeast Oklahoma’s bigger race sponsors and chip timing providers. More recently, backpacking and bushcraft has captured his interest. Being a goal-oriented fella, the lure of thru-hiking the Appalachian Trail hooked him hard. He’s done a lot of research and beefed up his gear stash with his eye on attempting the AT in the not-too-distant future. When I put out some feelers on social media about going to the Wichitas, he was keen to do it. The plan, in his mind, was to see a new place, don his new gear, and test it out. He also wanted the extra burden of loading his pack and doing our day hikes with the same gear he intended to carry on the AT. The drive from Tulsa to the Wichitas was a quick three hours. We’d hoped to get a backcountry camping permit, but the refuge intentionally keeps permit levels down. Ten were issued, and that was all they could take. We settled for the established campsite at Doris Campground, which was fine by me. I joked that this meant we could use an outhouse rather than pooping in the woods. After setting up camp, it was time to hit some trails. 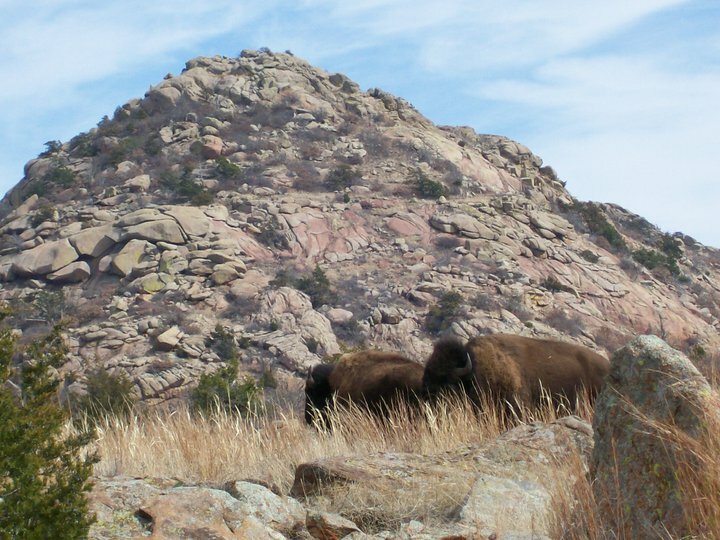 There are loads of hiking and climbing areas throughout the Wichita Mountains Wildlife Refuge. Most of the trails, while scenic, are also easy walks. The gateway to the Charon’s Garden Wilderness Area – the most rugged part of the range – has long been the Sunset trailhead at the foot of Elk Mountain. Looking at the Sunset Massif on the way up Elk Mountain. The mountain itself looks more like a broad mesa from a distance. It’s only when you get up close that the mountain’s rugged nature is revealed. Its southern face is steep, slabby and in spots sheer, and rock climbers can find numerous technical routes there. The northern slopes are gentler, and that’s where the Elk Mountain Trail goes. It ascends several hundred feet to Elk Mountain’s broad summit, where commanding views of Mount Lincoln, Sunset Peak and numerous other high points in the wilderness play out. Looking north on Elk Mountain. I opted for a day pack, but Brian went ahead and hiked in his full backpacking kit. Practice makes perfect, and there were going to be plenty of places on the AT where you’d gain hundreds – and sometimes thousands – of feet uphill on any given day. May as well get used to it now. Bouldery terrain at the top of Elk Mountain. The trail ends atop Elk Mountain, but doesn’t hit the summit. That would require more off-trail hiking and a little boulder hopping west, toward the steeper cliffs on the south and west sides of the mountain. Stiff, chilly breezes greeted us and a few other hikers on the hill that day. Curiously absent: wildlife. Aside from a few birds, Elk Mountain was quiet. Brian records some video and sound on the summit of Elk Mountain. Wind is noisy. West views from atop Elk Mountain. Brian checks out an overview looking east. We headed back down, but still had some daylight to kill. One more minor summit would do. Away from the wilderness area but still in the refuge is Little Baldy, a minor summit that guards over the dam at Quanah Parker Lake. Unknown to me at the time, but there’s a trail that leads from where we camped on the other side of the lake to Little Baldy, but I don’t think we would have been able to complete that hike before sunset. Quanah Parker Lake as seen while hiking up Little Baldy. Anyway, the dam is this cool concrete structure that looks like a miniature version of the Hoover Dam, built high in a ravine to impound the waters that now make up the lake. We parked at the dam, then hiked up the trail to the granite dome that is Little Baldy. For such a small point, it commands excellent views of the refuge and the lake. I opted to take a tougher scramble to the top; Brian wisely chose not to, seeing that he was hiking in his bigger pack (Brian would do a lot of smart things on this trip without any prompting from me). Looking northwest from the top of Little Baldy. This is a low-commitment, high-payoff summit hike. Little Baldy’s breezy summit and the lowering sun cued us to hike down and make some dinner before turning in. I’m a night owl, but when I’m camping the setting sun is my sign to hit the sack. After scarfing down dinner, we stayed up a bit, chatting about hiking, running and gear. I brought a six-pack of beer, a nice after-dinner treat to enjoy with the conversation (Shiner black lager – yum). With that, we turned in. It would be a cold night – and quite memorable – to set the stage for a more ambitious outing in the morning. Our camp was on the lake shore, and we had these fellas as neighbors. They were cranky when we got too close. In the next installment: Brian and I wake up to bitter winds, cloudy skies and a busy day hiking through the heart of the Charon’s Garden Wilderness Area. About the route on Elk Mountain: From the Sunset parking lot, cross the first bridge to the Elk Mountain Trail. The trailhead is well-marked, and the trail itself is easy to follow. Class 1, about 2.2 miles round trip. About the route on Little Baldy: From the Quanah Parker Lake Dam parking lot, follow the paved walkway to the dam and walk across the dam to the trail. The trail is mildly defined from here, and going to the top is a matter of easy route-finding to the top. Route length is 0.6 miles round trip. Class 1, with some minor boulder hopping close to the top. A creek running through Natural Falls State Park. A couple of days ago, I wrote about a developing big-win story for conservation efforts in my hometown of Tulsa. I was feeling pretty good about that, able to block out the signs that there was going to be plenty of bad news on the conservation front coming soon. For now, though, we celebrate. Good vibes all around. And then one day later, the other shoe dropped. Budget-makers at the Oklahoma Legislature asked the state’s tourism department to come up with a plan to accommodate a 14.5 percent budget cut the next fiscal year. The answer, in short: Close 16 state parks. I could write an entire post about how lawmakers’ reckless tax policies over the past decade or so led us to this point, making the state especially vulnerable during difficult economic times. Schools, health, public safety and child welfare have taken huge hits in Oklahoma over the years, in economies both good and bad. But I’ll let others discuss that. Instead, I’ll focus on what the Sooner State could lose if this plan becomes reality, and what this says about the national movement to turn over federal public lands to the states. I haven’t been to all of these, but of visited several of them. Greenleaf State Park is an awesomely hilly, wooded and wild place in eastern Oklahoma that’s long been a favorite for the outdoorsy set. Alabaster Caverns State Park features great caves to explore, is one of the few places you can go caving, and is prime habitat for bats. Osage Hills State Park is a hidden gem, nestled in wooded hills northwest of Tulsa. Red Rock Canyon State Park offers prime rappelling. A stretch of rugged trail at Natural Falls State Park. All of these could face closure if these cuts become reality in the state’s next budget. Needless to say, this would be a huge loss for the state, its residents, and the tourism industry that Oklahoma is promoting on its new license plates. The irony is pretty thick with that one. The plate encourages drivers to “explore Oklahoma” and visit the state tourism department’s website, travelok.com. But there might be less to explore really soon. The larger point: Oklahoma is showing why you don’t want to hand over federal public lands to the states. Oklahoma is just one of many states to pursue the Kansas-style form of tax policy, that lowering taxes will increase job growth and eventually lead to higher revenues. That hasn’t happened in Kansas, and it sure isn’t happening in Oklahoma, Louisiana, and many other states that are experimenting with this. Instead, it’s leaving states unable to fund even basic, core functions of state government. In Oklahoma, we can’t pay our teachers enough to compete with surrounding states, and they’re leaving in droves. Our state troopers can only drive so far from their headquarters to patrol the highways. Our prisons are staffed at 65 percent with underpaid guards who often have to resort to food stamps to feed their families. Is there any doubt that Oklahoma could not handle the added cost of taking over its part of the Ouchita National Forest, or the entirety of the Wichita Mountains Wildlife Refuge? How much greater would this burden be on cash-strapped western states where the federal public lands inventory is much larger? And maybe that’s the end-game, to give public lands back to the states, who, when forced to carry that burden, have no choice but to sell it all off. We know where that ends: Wide-scale privatization, which means loss of forest, loss of grazing lands, and loss of public access. The list of those who lose — hunters, anglers, hikers, backpackers, climbers, cyclists, ranchers, tourism businesses and more — is lengthy. Oklahoma’s budget process is still in the early stages, and it’s not certain what will become of its parks. There is already a petition going around to save the parks. But in the big picture, Oklahoma is the canary in the mine when it comes to public lands and land management policy for federal lawmakers and policymakers. Voters favor longstanding public lands policy that preserves national parks, forests and other federal holdings for use by the people. Adopting a policy of divestiture in favor of state control will do exactly the opposite of what the majority of the public wants. And by looking at what’s happening in Oklahoma, we know what the end result will be: a rapid loss of public access to treasured natural spaces in favor of the highest bidder. 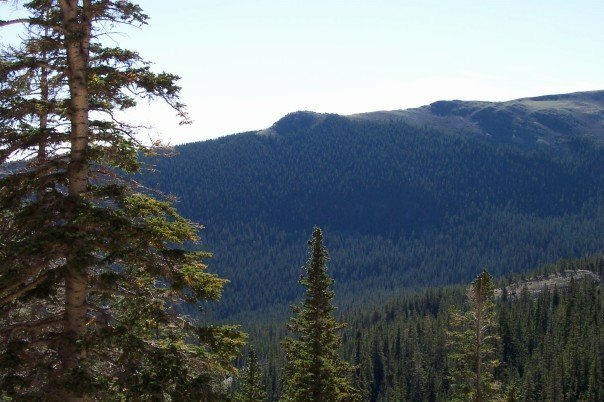 Kit Carson National Forest, as seen from the Wheeler Peak Wilderness Area in New Mexico. Beautiful public lands. Certain memories never leave you. They make an impression — hopefully for the better — that doesn’t just bring a grin to your face, but becomes a part of the fabric of who you are. I’ve got a lot of those. Many times, they build on each other, sort of in the way that a series of short outings becomes a longer life journey that takes you where you were always meant to go. It’s a satisfying feeling when you encounter one of those moments, then look back and realize how the events of your past led you to that amazing point in time. That happened to me about nine years ago on a backpacking trip to northern New Mexico. There were five of us there, and we spent the day hiking up to a high alpine lake perched on the lower slopes of Wheeler Peak. Tall stands of evergreens and aspens were all around, carpeting the Wheeler Peak Wilderness Area, a patch of wild land that is part of the sprawling Kit Carson National Forest. I was first up that morning, crawling out of my sleeping bag and lighting my stove to cook a little breakfast. The rest of the gang was still trying to get a few more minutes of sleep before we’d head up to the highest point in New Mexico, then march back down the hill to civilization. As I was boiling my water, I looked to my right and there they were — a female bighorn sheep and her lamb, staring at me, then casually easing their way up the slope to investigate our little campsite. They seemed completely unconcerned about the presence of people — this was their land, their home, I guess, and they’d probably seen folks like us come and go many times. They came so close that I felt I could have stood up and scratched mama behind the ears, though I know that would have never happened. Still, when you live in a community measured in the tens of thousands, or hundreds of thousands, or millions, real wildlife encounters like that aren’t all that common. Not with creatures like these. We made a lot of memories on that trip, and yeah, we did bag Wheeler’s summit on a bright, bluebird day. But that morning in camp stuck with me more than anything. That encounter exemplifies the value of public lands. We were well within the confines of New Mexico, but by law, that national forest and that wilderness area belongs to all of us. The same is true of many other places across the West, and indeed, the entire country. Some plots of land were meant for individual landowners. But some, by their very nature, are just too precious to sell off or give away. They belong to everyone. Unfortunately, that value — one that was so strong in the hearts of conservationist heroes like Theodore Roosevelt and John Muir, and still strong with the public at large — is waning in the houses of power. In Utah, politicians there — backed by lobbyists representing energy and mining interests — are passing laws demanding that the federal government cede those public lands to the states. Utah actually set aside $2 million to sue over it. And the sentiment behind that is only growing. Changing political tides on the national level are beginning to mirror Utah’s model. In March, the Senate passed an amendment (Senate Amendment 838) to a piece of legislation that would authorize selling or giving away huge quantities of public lands — those in national forests, wildlife refuges, and tracts owned by the Bureau of Land Management. Basically any federal land not already claimed by national parks or national monuments. The amendment passed 51-49, mostly along partisan lines, with three Republicans voting against it. The measure was advanced with the ever-popular arguments of affirming states’ rights, shrinking the federal government and closing budget holes, but the reality is far more opportunistic. Forest Service and BLM lands are filled with places that have yet to be explored for oil, gas, rare earth metals, coal and other exploitable resources that any number of companies would love to extract. Billions could be made, though that doesn’t necessarily take into account the billions already being earned by people whose livelihoods depend on tourist dollars from Americans and foreigners itching to take in the wonders of the country’s vast, wild spaces, some $41 billion a year according to The New York Times. All told, that supported some 355,000 jobs. I don’t have a problem with people wanting to earn a living, or really make a go at hitting it big. But when you’re talking about the industrialized extraction of natural resources, there is a huge and often permanent cost. 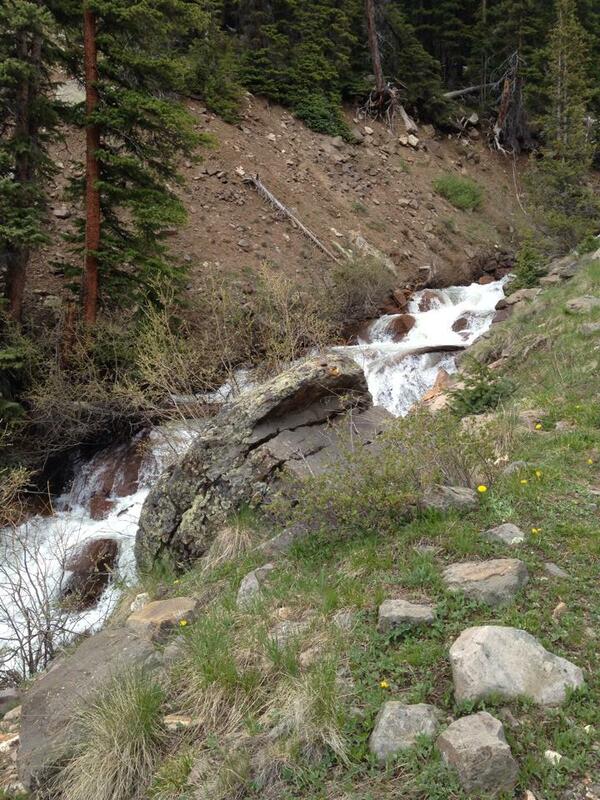 Matterhorn Creek in southwestern Colorado. It’s pretty, but those waters are fouled by mine tailings. In another favorite mountain haunt of mine, north and west of Wheeler Peak in southwestern Colorado, is the Matterhorn Creek Basin, a drainage that slopes downhill from Matterhorn Peak, Wetterhorn Peak and a large collection of other, lesser mountains that make up the area’s dramatic, primordial landscape. This place is drop-dead gorgeous, but I can’t filter water there for drinking or cooking, at least not in many of the creeks and streams flowing to the south. Old, small-time mines that are long abandoned still taint the watershed with mine tailings, making the water there unfit to drink. The San Juan Range is pockmarked with gorgeous places just like Matterhorn Creek Basin that are beautiful to look at, but traversed by waterways permanently spoiled by mines of yore. If you go out east, in Appalachia, or north, near Butte, Montana, you can see much bigger scars on the land. Strip mines, pit mines, and mountaintop removal have all done a number on these places. In my home state of Oklahoma, in an area dubbed Tar Creek, lead and zinc mines left behind noxious chat piles the size of small ski hills, fouling streams and giving local children lead poisoning. Collapsing mine tunnels threaten to swallow buildings whole. 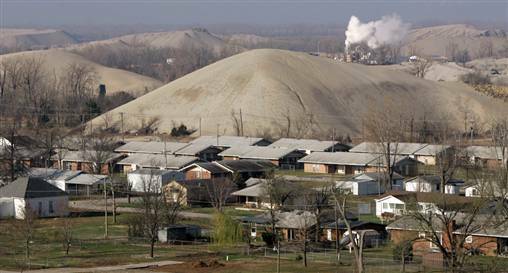 It got so bad that the entire area was declared a federal Superfund site, and two towns — Picher and Cardin — were bought out, their residents moved and businesses closed. There were booming times in that corner of Ottawa County decades ago, but now just a couple of polluted ghost towns remain. These are just a few tales from the dark side of harvesting natural resources from the ground. But no matter. Many states are hungry for economic development, and the lands they’d sell off are out of sight and out of mind to politicians in the big cities and manicured suburbs where most of their votes and donors come from. No one knows much about Matterhorn Creek’s spoiled waters because almost no one lives nearby, and getting there takes a little work. I just wish I could show it to them. I checked a roll call of the Senate vote to approve this particular measure, and not surprisingly, both my senators were in favor of it. I didn’t bother writing Sen. Jim Inhofe. I just didn’t see the point. He’s the guy best known as the Senate’s chief climate change denier, and recently brought a snowball into the Senate chambers to prove that climate change wasn’t real. Conservation isn’t real high on this guy’s list of priorities. I’ve heard from friends who know Sen. James Lankford, and they say he’s a reasonable man, one who will listen to others’ ideas. So I sent him a message last week. I’m still waiting for a response. A scene from the Wichita Mountains Wildlife Refuge in southwestern Oklahoma. The refuge is not only home to rugged peaks like this one, but herds of American bison like the ones in the foreground. Wildlife refuges are among the federal public lands that could be sold off if SA 838 is enacted. What I’d like to tell them is that while Oklahoma doesn’t have nearly as much federal public land as many western states, we do have amazing tracts of broadleaf and pine forests in the hills of the Ouachita Mountains (home to the Ouachita National Forest). Within the crags of the Wichita Mountains (where a U.S. wildlife refuge is found) there is an amazing biodiversity that surpasses any zoo. Buffalo, elk, coyotes, eagles — so many creatures in such a rugged, picturesque and special little realm. Do these guys really want to put these places up on the auction block? Have they ever been there? Do they even care? Conservation has its roots in places like the Grand Canyon, Yosemite and Yellowstone, locales so impossibly gorgeous that they’ve been declared national treasures by men and women far wiser than me. Born from that sentiment was a system of public lands that helped preserve vast acreages of wild spaces that are, many times, no less impressive, places like Wheeler Peak, the Ouachita National Forest, or the Wichita Mountains Wildlife Refuge. Conservationists gave me the ability to camp in a New Mexico alpine forest, deep within the folds of a protected wilderness area where I could bask in that national treasure and share a breakfast moment with a couple of curious bighorn sheep. Hike in to Lost Lake, and you can see that, too. That’s the beauty of public lands. My experiences can be yours, too. Or anyone else’s. These places belong to all of us. So please don’t tell me that they’re for sale.